Obtained a Bachelors of Science Degree in Business Administration and Marketing. Formally studied the Double Bass under the pedagogues: Frederick Zimmermann, Assistant Principal of the New York Philharmonic; Orin O’Brien, New York Philharmonic; Georges Andre, Metropolitan Opera; Robert Gladstone, Principal Bassist Detroit Symphony; Samuel Hollingsworth, Principal Bassist Pittsburgh Symphony Orchestra; David Holland, renowned Jazz artist. 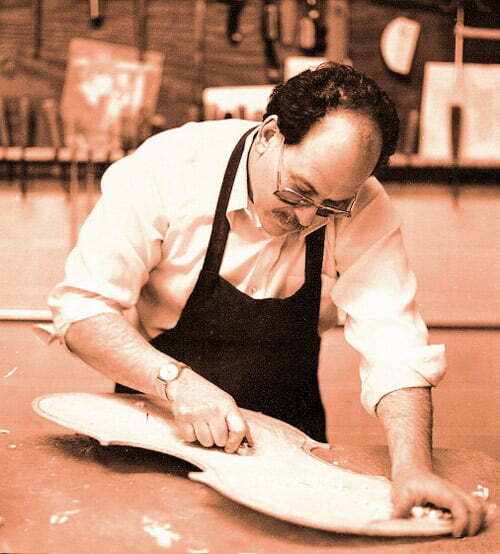 Served in formal apprenticeship for instrument and bow restoration, construction and appraisals, under the expert auspices of renowned violin and bow maker, restorer, and appraiser, Samuel Kolstein. Served as staff instrument and bow restorer as well as making numerous new violin and celli with Samuel Kolstein. Promoted to head violin master in the shop of Samuel Kolstein. Assumed full business responsibilities for operating all aspects of Samuel Kolstein & Son, Ltd. and Kolstein Music, Inc.
Head violin maker, restorer, and appraiser with a staff of nine violin makers working under my supervision. Published numerous technical articles on restoration and appraisals in the International Society of Bassists with feature article published in the Strad, February 1991; presently editor of the “Luthier Corner” in the International Society of Bassists magazine restoration and repair forum; published regularly in the Double Bassist magazine and the Strad magazine, both of London, England, since 1996. These articles have ranged form interviews with makers and performers, technical articles on repair/making, and expert appraisal articles on historic master makers; featured in the violinmaking segment of Robin Lehman’s documentary, Young Peoples Guide to the Orchestra; contacted to appear in the upcoming educational video on “Careers in Music”. On the expert appraisers staff of Art Conservation fine arts adjusters as a String Instrument and Bow Expert. Listed in The Violin Makers of the United States, by Thomas J. Wenberg, Mount Hood Publishing Company, 1986.